Can I Brush My Dreads? In most cases, the answer is no. Dreadlocks are inherently designed to be intertwined, and brushing could unravel them, negating all of the hard work you put into creating them. Can I Wash My Dreads? There’s some belief that dreadlocks shouldn’t be washed, but this is completely false. It’s important to note that washing your dreadlocks too often may cause them to dry out, but washing them once a week is perfectly fine and can even benefit your dreads. Just be cautious of the shampoo and conditioner you use, as certain varieties may leave residue in your hair. How Can I Make My Dreads Grow Faster? 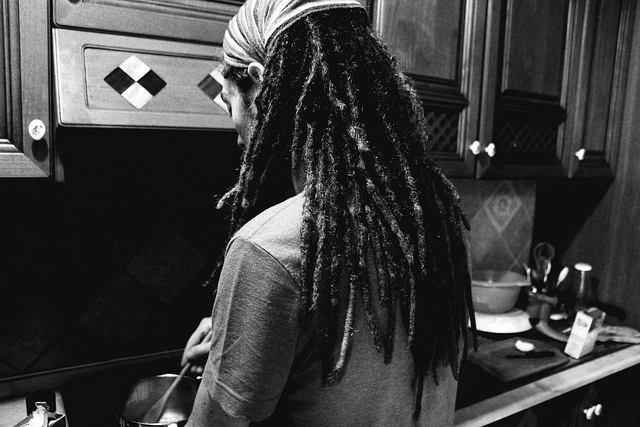 You can check out our previous blog post here for helpful tips on how to make your dreadlocks grow faster, but you’ll want to pay close attention to your diet, as this holds the most influence over the speed at which your hair grows. Limit your intake of sodium and refined sugar (fruit sugar is okay), and focus on a diet consisting of lean meats, whole grains, and fresh vegetables and fruit. Trust me, your body and hair will thank you later. Should I Cover My Dreads When Sleeping? It really depends on your hair type. If your dreads have a tendency to dry out – which can lead to split-ends and other forms of damage – you may want to wear a cap when sleeping. Doing so will prevent your scalp’s natural oils from escaping, helping to moisture your dreads in the process. Can I ‘Undo’ My Dreads? This is a question many who are thinking about getting dreads ask. There’s always the option of cutting and shaving your dreads to remove them, but you can often undo them if they are still relatively young (less than a year old). It involves washing and rewashing them with lots of conditioner until the dreadlocks unravel. Undoing a full head of dreadlocks isn’t fast, nor is it easy, but it can be done. Can I Go Swimming With Dreads? Of course you can! Anytime you swim with a full head of hair – regardless of the style – you may notice some stray strands falling out. This is completely normal, though, and should be of no concern. In fact, there’s some belief that the ocean saltwater will actually clean and re-energize dreadlocks, helping them to grow faster and look healthier. Should I Wrap Rubberbands Around My Dreads? Many people swear by the use of rubberbands when growing dreadlocks. Placing them at the base of your scalp can prove useful in separating your dreadlocks from the new hair. This can prove particularly useful during the first few weeks of sporting dreadlocks, as it encourages them to grow the right way. Feel free to try it yourself to see whether or not they are beneficial for your dreads.